LSD rear end for wagons thread. Post subject: LSD rear end for wagons thread. I for one drive my car on the street. and for the power it will make and small tires i use I know i will be yearning for an LSD out back. So I want to make a thread on the subject. post here if you have done this already. there are likely more ways than one. the way i would like to do it is using the original inner cup/fange setup. the factory LSD that might work as a drop in is the evo 3-9 factory clutch pack diff. I read through all 13 pages how to get this rear end in a 1g and 2g. the easiest path was for the 2g guys that had a non lsd rear. all they needed was the evo 3-9 diff and axle cups. the non lsd axles use the same size tripods. the 2g cups do have correct spline size, but one side was too short. so the cup never reached the snap ring groove to hold it in place. this info leads me to believe the expo spline/flange with insert into diff and have the same problem as 2g. I have a solution for that problem. but need to see these parts in person to see for sure my solution will work. the second option gets complicated real quick. and that would be to use the 1g 2g style LSD diff. these are viscous type. and use funky axle plug ins. so you would need to build full size axles that plug in on both ends. this may actually be easier to accomplish but will be difficult to service axles. you have to pull whole trailing arm off or drop whole rear case to get an axle out. does anyone have a inner flange for inner cup laying around? i would like to get the dimensions like in post 303 on this page. Post subject: Re: LSD rear end for wagons thread. We tried 1g guts in the van diff. It will not work. I think we even tried 2g guts. After a few weeks of messing around, we gave up. To this day the van still has an open diff. It is still stock as well though. thanks for that info. I gathered that might be the case from the DSM thread above. basically the viscous lsd does not fit in the non-lsd housings. however the evo 3-9 clutch pack style lsd does fit in the non lsd case.. so that is what I will be focusing on. its just a matter of finding how to configure the axles. there was mention a few weeks back that someone is running an lsd from using a combination of 1g and 2g parts. I pm'd him and he is trying to get the exact details. Leon, is the fastest van on here and his 60fts are impressive enough to think an LSD is not really needed. at lest for drag racing. I am more of a street car guy and lke to corner fast on slippery street tires. I am not so sure i want to run a tire like Leon is running. But i am keeping that in mind if it gets too complicated to get an LSD in the rear. It stands to reason that you would be pioneering this sort of swap, but if it can be done, documenting this is monumental for the next step in the evolution of older Mitsu products getting a revitalization of sorts. The VANS! Looking forward to seeing what happens here, even it is to determine that certain combinations or all combinations have issues with the stock drivetrain at this time. So many parts do fit together, just a matter of finding what is available and hopefully making it work. thanks for posting that leon. its a start. clearly 2g axles are too long. I have an evo 9 rear with axles here. I will know something as soon as it stops flooding here. dang been raining here for like two months straight. Guys, I am playing with the idea of adapting 3000GT rear end parts. Has anyone replaced rear wheel bearings on AWD suspension? The galantvr4.org guys seem to know a fair bit about that suspension setup, as some are adapting 3000gt/VR4 rear arms/knuckles/subframe? (but 3si.org must have something in picture form to show you what you need to know). this would be very complicated on the van. the rear suspension is unique to the vehicle. remove axle cup last night to do some research. there is no diff bolt-in that will work with factory axles. the splines are very small on this non-lsd rear. from initial measuring it looks as though evo 1/3 axles and LSD would swap in. there are two types LSD from the early evo. viscous type which is same as 1g. and clutch type which is same as evo 8.
so you could use 1g lsd and evo 1 axles. 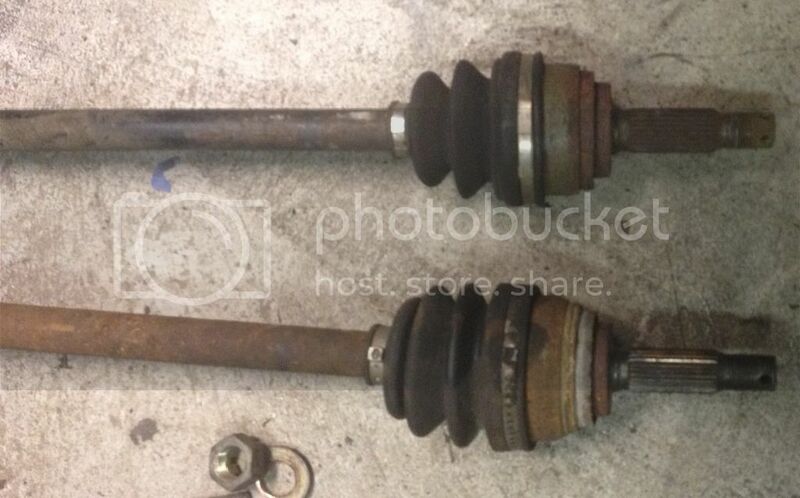 or evo 3 LSD and evo 3 axles. possible evo 8 axles will work as well. they do fit evo 3 LSD. not sure they are correct length, but pretty sure they are. yeah i apologize for misleading or getting anybodys hopes up. i dont know the guy enough to know if hes telling the truth or not. i told him it cant be done, then out of spite i guess he "did it" and i asked him how a few times and he just said it was just random axles that were laying around. so probably bs. been on and off researching this more. what i found is the summit , evo 1/3 , and 2g use equal length axles in the rear. I will have to pull my axle out all the way to measure. but here is what i found for different axle lengths so far. one of these lengths should work. EDIT: wagon axle comes in at 30+1/2 so it looks like early evo axles are the winner here. before i pulled right axle I loosened nut to see how much I could compress axle on car. I measure .660". what this means is the 2G axle will likely be just a tad too long. they might bind in the cups. havent measured the left side yet. so i will know exactly how centered the diff is and how much longer axle might be possible. the outer bearing carries it own seal. so one could run a spacer on the outer CV with no ill effect. easily ad 1/4" to axle length if not more. you would have to drill more holes for cotter pin or run a thinner nut. the inner cv cup is strongest when spider is closer to bottoming out. and weakest if its about to pop out. only question left for me is if the dsm/evo1 viscous diff will fit in the wagon housing. I would rather use the viscous over the clutch type myself. not building an auto cross car here. the clutch pack doesnt really shine till you tweak them with more plates and such. and then they make noise which is not for me. too bad neither outlander axle will work. they can be had new for $47 each. I would have been all over that. just curious if you remember exactly why the 1g LSD would not fit inside the van housing? They know a lot, but not as much as I would like... I have been looking more and more into the 3000GT rear end. I would like to transfer the diff and hub assemblies (complete with bearings, brakes and spindles). Then, do whatever needs to be done to the axles to make it all work (probably shorten them a bit). - correct extreme negative camber (by welding in hub assembles at an angle). What makes this more difficult to pass up is the fact that I found fairly rust free 92 3000GT rear end assembly 90 minutes away from my house for $300! 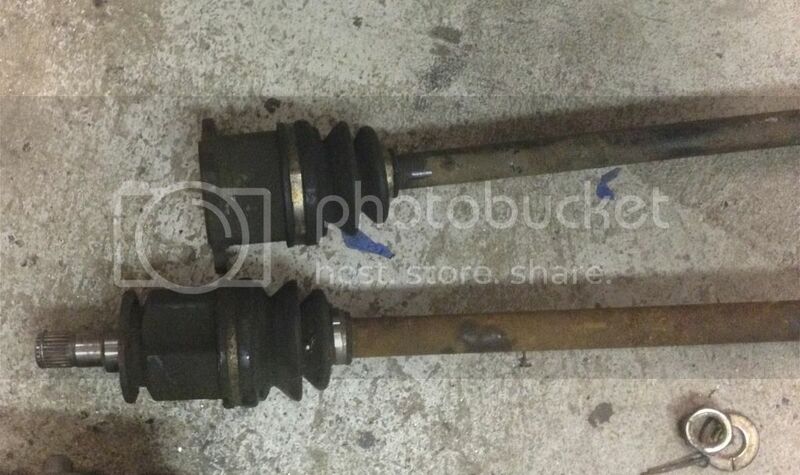 FYI: I sold my old 2G axles for $250 and pumpkin for $180!